With I Want Someone to Eat Cheese With and now Dealin’ with Idiots, comedian Jeff Garlin has started an oeuvre of modest, immensely personal films inspired by his own experiences. 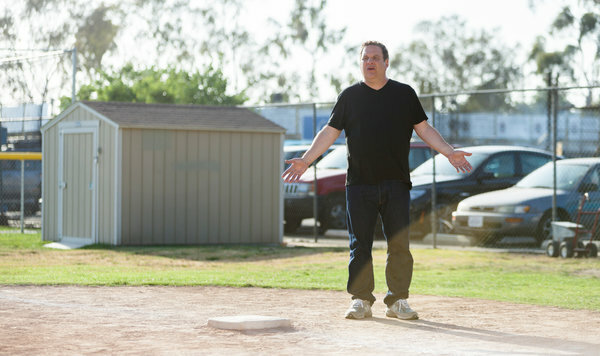 If his 2006 feature was a pathetic version of his life—fat, single, unsuccessful and living with his mother—his follow-up is probably closer to the truth: Here he’s Max, a famous comedian and father, equal parts disgusted and fascinated by the antics of the parents of his son’s youth baseball team. In a meta move, Max decides to get to know these wackos for research for a film—this film. What first seems like lazy storytelling—instead of coming up with an original narrative, Garlin makes a movie about making a movie—turns out to be a stroke of genius, allowing him to dip into these characters’ lives without it seeming contrived. Eager to impress Max for a starring role in his story, they invite him into their homes and places of business, granting an empathetic glimpse at what drives their ridiculous behavior. Garlin has surrounded himself with funny, funny people, and despite playing the film’s resident comedian, he wisely plays the straight man, letting his costars go on in hilarious improv. Among Max’s subjects are Coach Jimbo (Bob Odenkirk, basically brilliant), whose day job as the manager of a copy shop explains a lot about the fear-mongering way he leads the team; Harold (Richard Kind), the henpecked husband to overbearing team mom Rosie (Jami Gertz); Coach Ted (J.B. Smoove), who operates a trailer-house compound and participates in an autobiography writers group with bikini-clad white girls named Tipsy Jessica (Natasha Leggero) and Jackie the Chocolatier (Deanna Brooks); Sophie (Gina Gershon) and Caitlin (Kerri Kenney-Silver), the lesbian moms to an adopted Latino son; and Marty (Fred Willard), whose perennially cherry demeanor belies a woeful financial situation. Running parallel to Max’s research is a more conventional plot about fathers and sons. Max would like his boy, who doesn’t even really like baseball, to go ahead and swing the bat despite Coach Jimbo’s advice to try for a walk—or even better, to get hit. Amid the chaos, Max occasionally retreats to reveries featuring his own dad (Timothy Olyphant in a preposterous, though not unpleasant, bit of casting). Max’s son’s arc from team hero to team zero is a familiar but firm framework on which to hang the rest of Garlin’s rather unstructured material. Dealin’ with Idiots ends on an offbeat note but manages to avoid the sentimentality that comes with Max realizing he’s just as much as a nutjob as everyone else. Garlin’s second feature is consistently sweet, funny and smart. Keep it up.